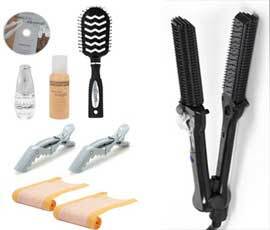 MAXIglide is the revolutionary styling tool that makes traditional flat irons irrelevant. It is the result of almost seven years of R & D - and over one thousand prototypes! Its unique design creates smooth, shiny, straight hair up to five times faster, without the need to blow dry your hair smooth first. The key to its performance is its multi-patented design which includes multiple rows of detangling pins, steamburst system, protective ridges, and ceramic technology. MAXIglide is the world’s ONLY straightener with detangling pins, ASTA (Advanced Seamburst Technology), and protective ridges that can take your hair from frizzy to smooth - to shiny and straight - in ONE STEP, with one tool - period! Accept no imitations!